Trader Joe’s Pinot Noir or Costco’s Pinot Noir? Which is better, Trader Joe’s Pinot Noir or Costco’s Pinot Noir? 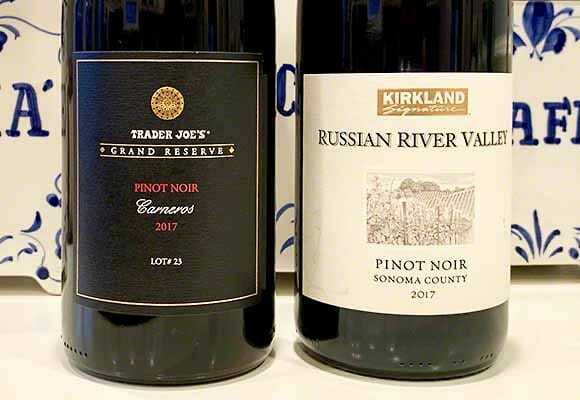 We blind tasted side-by-side a Trader Joe’s Pinot Noir and Costco’s Pinot Noir. Both Trader Joe’s and Costco have private-label wines. Trader Joe’s has several levels but the Grand Reserve is their second highest quality label. Platinum Reserve is Trader Joe’s premium label. Costco has the Kirkland Signature label for all of their private-label wines. We purchased a bottle of the Trader Joe’s Grand Reserve Pinot Noir Carneros Lot 23 2017. The price is $12.99. At Costco, we purchased a bottle of the Kirkland Signature Russian River Valley Pinot Noir 2017. The price is also $12.99. Which one did we like the best? The Trader Joe’s Grand Reserve Pinot grapes are from the Carneros AVA. Cool climate and breezes are generated by the waters of the San Pablo Bay. 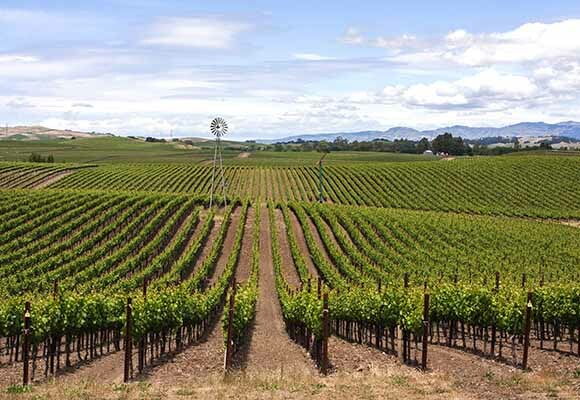 The Kirkland Pinot grapes are from the Russian River Valley AVA. The influence of the Pacific Ocean and the waters of the Russian River provide a daily dose of cooling fog to the vineyards during the growing season. Both Pinot Noir wines are a beautiful light color, the TJ a tad darker. In aroma, the Kirkland Pinot has more fresh strawberry and raspberry, while the TJ Pinot has more cherry and spice characteristics. Both are medium-bodied Pinots, with a delicate balance of acidity and tannins. The Pinots are lighter in style, more traditional of Pinot Noir. Both have fresh fruit flavors, but the Kirkland is more complex. The TJ has a nice dose of spice. The finish lingers longer in the Kirkland Pinot Noir. These two Pinot Noirs are both excellent choices for a beer-budget wine consumer. They both taste like $25 to $30 Pinot Noir wines. We give the nod to the Kirkland Signature Russian River Valley Pinot Noir – 89 Points. The Trader Joe’s Grand Reserve Pinot Noir we rate at 88 Points. We do like them both and hope you try them. I loved this side by side tasting and the descriptions. I don’t have access to Costco, so I especially enjoy the wine mentions from Trader’s. Thanks!! Thanks! I really appreciate this comparison and look forward to more.